Digg this! Let me INTRODUCE a new segment to my blog: Readymade Design Scapes. My intention is to plan and artistically fashion 'scapes' which are conceptual rooms (bathroom, kitchen, etc ) that will be intimate, quirky, luxurious and offer products that you can find at your local plumbing, tile and lighting showrooms. Series 1 will focus on edgy bathroom 'scapes' highlighting tiles from Porcelanosa and fixtures and fittings from Alape and Duravit. 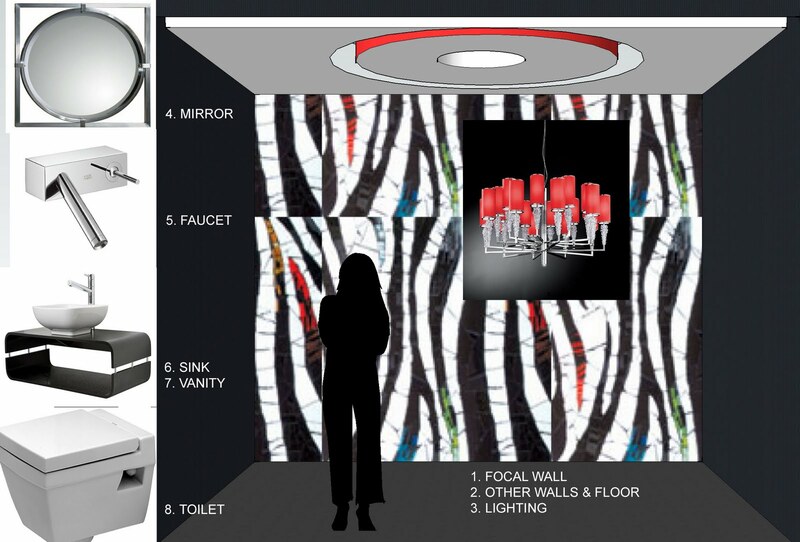 The Zebra 'scape' is a conceptual boutique powder room found in a contemporary residential home. The intention is to have a powerful feature wall as you walk into the room balanced with circular cove lighting above and modern fixtures, fittings and accessories. 2. Wall & Floor tiles: Porcelanosa's Crystal dark 13" X 40" porcelain tile. It looks like black glass. 3. The 41" Subzero chandilier puncturing thru the circular cove is made up of Bohemian crystals, fabric and metal. Its a WOW piece! It provides ambient illumination and also has a center halogen down light to provide task or accent illumination. You can purchase it thru http://www.y-lighting.com/. 5. Hansgrohe's Axor Stark X Faucet is a wall mounted facuet, truly minimalistic in design. 6. Circa Alape white enameled vessel sink. It is a simple contemporary design. 8. Duravit's floating Second Floor toilet #220509. How can you love a toilet? But I do! I have it in my Zen bathroom! (see Zen modern blog) The flushing system is hidden inside the wall. All you see is the toilet and a plate for flushing. Very cool!